In 91 years, Chuck never moved more than eight blocks from his roots. Six decades later, Chuck would reach out to his dad and help him in his later years. Every Sunday afternoon, Chuck and Maggie took their aging fathers out for lunch and a drive. The 1930’s and 40s were hard times as Clara worked numerous jobs, the children contributed their meager earnings, and they even housed boarders at their home. Chuck graduated from South Kitsap High School in 1944, and after some electrical apprenticing, decided to open a Texaco gas station with his brother, Tom, in 1947. Smiling back would be the handsome, beaming face of Charles Edward Cookson. The gas station hired a young, vivacious bookkeeper from Parsons, Kansas, in the late 1940s. Margaret Irene Taylor married Chuck on August 7, 1950, one day after his 24th birthday. Two months later they moved into an 800 square foot upstairs apartment on Bay St. just one hundred yards from the station. Early in their marriage, Margaret learned she couldn’t have children. But God had other plans. On February 26, 1952, they joyously welcomed Shirley Jean Cookson into the world. All three were true. Shirley would remain an only child, prompting me to remind Margaret that I had to be her favorite son-in-law. Chuck was one of the hard-working men I ever knew. He served his customers with grace and a smile that could light up a room. He was a quiet man who didn’t serve in WWII due to deafness in one ear (caused by Scarlet Fever when he was young). During the Korean War, he was accepted, but was deferred due to Margaret being pregnant with Shirley. He went back to work and flashed his famous smile at Cookson’s Texaco for nearly five decades. One fringe-benefit of being a poor son-in-law in the late 1980s was getting free gas during the height of the oil embargo–that pushed prices alarmingly over $1 per gallon! During Chuck’s years as a small business owner, he often worked 84 hours a week–twelve hours a day, seven days a week. He woke up at 4 am, did his routine, then opened the station at 6 am. At 6 pm he walked or drove the one hundred yards to their apartment, had dinner, spent some time in “his chair,” and then went to bed before 9. In his later years, he continued to go to bed early and get up at 4. Only change? His reclining chair became his bed. Early in their marriage, Chuck and Margaret started attending First Christian Church, close to their apartment and actually the first church in Port Orchard. In the 1960s, through the preaching and friendship of Pastor Jack McDaniels, Chuck was baptized. He would later serve as the perfect church greeter, known for his warm and firm hugs. Due to the Cookson connection at FCC, the church would become the “anchor” supporters of Shirley and my forty plus years in Youth With A Mission. Father and daughter were two peas in a pod. During his sixties, Dad Cookson deepened his faith greatly. I remember meeting with him personally during that time and watched God do a deep work in his heart and life. He closed down the station in 1994, and lived his retirement years in his favorite chair in their apartment, while serving family and church. Chuck’s early and retirement years served as bookends on a half century of hard work with a smile and a hug. It was a simple, but great life. This summer, as he approached 91, Dad grew weaker. He had never loved doctors and medicine. In fact, before he passed, he hadn’t seriously seen a doc for sixty years! He believed in hard work, healthy eating and plenty of supplements (kelp pills, soy powder, vitamins and the like). In his thirties he’d been diagnosed with a serious form of anemia, but it never stopped him. Years ago, a physician told to take blood pressure medication. He refused–and lived to 91. He’s always told Margaret he wanted to die at home. He wanted to pass into eternity from the place he’d lived most of his life. Margaret kept vigil day and night and Shirley remained present, always serving. 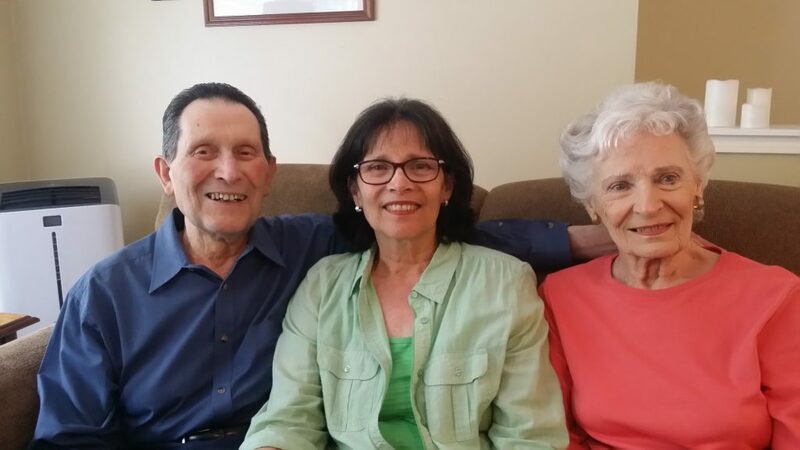 The final afternoon, Chuck was unusually alert and shared eye contact and some words with Margaret and Shirley–the two people he loved most. The room glowed with tears and words of affection. I stayed overnight the final four evenings to be a needed male presence. I sang to Chuck “Swing Low, Sweet Chariot,” talked about heaven, and told him that, though we would miss him greatly, it was “okay” to “go home.” Margaret slept on the couch, just three feet from the hospital bed. At 5:30 am, on Friday, August 18, God woke me and nudged me to check on Chuck. Margaret was awake, and together, at 5:45 am, we heard him gasp his final breaths, then be released from his body to meet Jesus face-to-face. You don’t measure a life by countries visited or possessions owned. All that really counts is faith and love which, when completed, bring everlasting hope. Chuck Cookson’s faith brought him salvation through Jesus Christ. His life blessed many others. Now he is simply redeemed–and thoroughly enjoying an eternal smile and infinite hug. Thank you all for the great memories of Chuck, your friendship and prayers. We look forward to remembering his life and love at the Memorial Service at First Christian Church in Port Orchard on Saturday, September 16 at 11 am. A wonderful tribute. Chuck is dearly missed… one of the favorite aspects of worshipping at First Christian was the no-hold-barred greeting from Chuck. He is a man who is "great in the Kingdom" by my reckoning. Love to Maggie and all the family. What a great story of resemblances. We thank yoiu for it and know it was a great time to take care of your Father in law. we took care of all 4 of our parents till the passed on to Jesus, so we know the joy and sorrow of it. So sorry to hear of Chuck's death. Thankfully you know he is with Jesus and happy to be there. blessings and peace to your family durning this time of adjustment. Not a moment too soon or a moment too late his room was ready in glory and Heaven Rejoiced. May the Comfort of our Loving Saviour be your portion today and tomorrow. Thank You Lord for a life well-lived. What a great tribute from a son-in-law. And indeed you were a great husband, son and care giver in his last days. Indeed Chuck was a kind and great guy . . .and really an icon in Port Orchard. Ron…thanks for such a loving and touching tribute. It seems especially fitting that you and Shirley were nearby for these final years…blessed is your father-in- laws destiny! Hope to see you when we're in Port Orchard 'late' next month.